Gumby and Pokey date back to the 1950's. 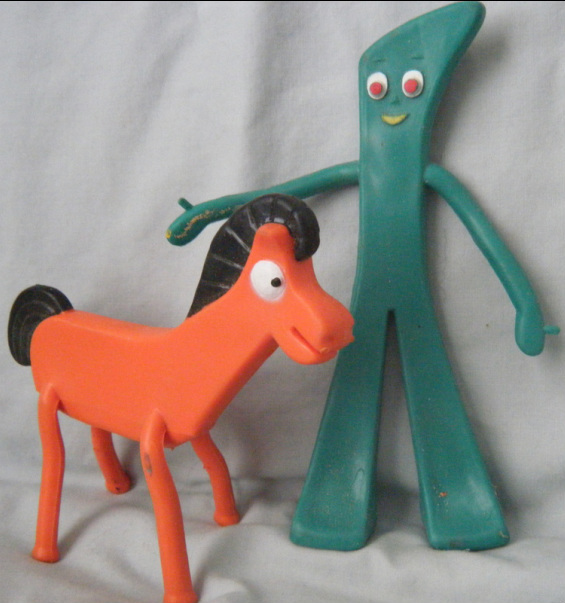 I can't recall when I received my green Gumby and his orange horse, Pokey, but it had to be in the early 1960's. I vaguely remember watching reruns of the stop-motion animations featuring Gumby on the family's black and white television. What made Gumby fun to play with was the fact that he was posable due to being formed around wire armatures. Like my Liddle Kiddle, Gumby's wires started to poke out and prick fingers or scratch furniture. He suffered the same de-wiring operation as Bunsen Burnie. After that, Gumby could only stand upright with his arms spread eagle. He could still straddle Pokey but he could not grip imaginary reins. I really don't remember much about my Gumby other than the mysterious circumstances surrounding his disappearance. When I was fairly young, my father finished off our basement. We used to run around and swing about on the support poles until he framed up some walls and started putting up pine paneling. One evening, during the finishing process, I was playing with Gumby in the basement. I was pretending Gumby was riding up and down in an elevator in some partially open stud work near a support pole. I left Gumby tucked in a shadowy little space between the studs when my mother called me upstairs to take a bath and go to bed. What I didn't realize was that my father was going to panel over that area after we kids went to bed. When I went downstairs to play the next day, the room was finished and Gumby was sealed inside the wall. My parents assured me that I must have left him somewhere else and that the wall could not be re-opened to look for Gumby. I don't remember what became of my riderless Pokey. Many years later, I was still bothered by Gumby's horrific fate and decided to fish the wall from both above and below where some gaps existed near the ceiling and the floor. While I did recover bits and baubles that had either been swept under the molding or dropped through the open spaces in the rafters above (most memorably - a large rubber horse shoe which I hung in my room), I was never able to confirm the presence of Gumby in the wall. I briefly contemplated the possibility of using a portable x-ray machine to scan the wall but then realized that a wireless Gumby wouldn't produce a skeletal image. More years later, I received a new Gumby and Pokey set. And someone gave me another set. Now I have two of each - both fully wired. I don't play with them or display them, they remind me of my missing original. The house containing Gumby stayed in the family up until this year. The house has now been sold and Gumby has new owners - but neither he or the new owners know it. Perhaps someday, in the distant future, the house will be remodeled, or torn down, and a worker will discover a dust covered, antique, wireless Gumby hidden in the wall, and wonder how he got there. Hopefully, Gumby will get displayed or played with. One of my reproduction Gumby and Pokey sets. Pokey looks like he is pondering the fate of my original Gumby and if he will experience the same fate as "Time Capsule" Gumby.